The gang over at the Film Photography Project are the purveyors of a great podcast and selection of film in their online store. Make sure to subscribe to the podcast, visit their website, and participate in their group on Flickr. They’ve been a big help to many of us that are exploring film for the first time. And they are part of the inspiration behind Utah Film Photography in that we want to share our knowledge and experience. 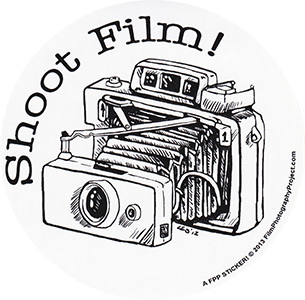 We are giving away some Film Photography Project “Shoot Film!” stickers. The lovely round paper design features an adhesive back that is ready for application on your favorite camera gear, gym locker or four legged pet. It features a hand drawn Polaroid Land Camera in black on a white background proclaiming your love for analog photography with the phrase “Shoot Film!” in a classic typewriter font. How’s that for a sticker description, eh? How do you get one? Leave a comment on this post and tell us where you’ll stick it. We’ll pick 8 people at random to receive stickers. All winners will be contacted by email on October 22, 2014. This entry was posted on Monday, October 13th, 2014 at 11:26 PM	and tagged with Giveaway and posted in Film Photography Podcast. You can follow any responses to this entry through the RSS 2.0 feed. I would stick it on my Leica…. oh wait maybe not. I would stick it on my Polaroid 360 of course. Perfect fit! Love it! I would stick to my Cannon or ipad! I can still see the rear bumper of my adventuremobile! Fantastic! It’s Nov 3rd. I hope I’m not to late to the party. I would love to add a Shoot Film sticker to my MacBook Pro next to my Eat Sleep Shoot sticker. THANKS for considering!